Hmmmm, is this cake really for ME??? It was truly an amazing day. 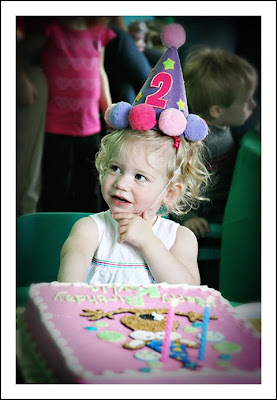 We had a birthday party at Kangazoom for our Kylie Bear. I just can’t believe she is two years old. It became so real to me when she woke up in the morning talking about “Kylie’s Birthday Party” and “Kylie’s Birthday Cake”. Could she really understand what we were talking about????? This picture is priceless to me. 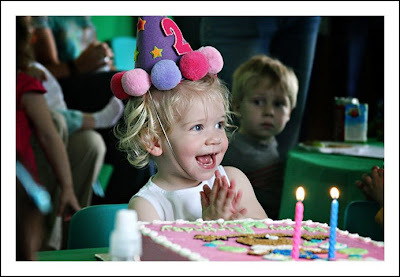 She was clapping her hands with glee after everyone sang her the birthday song. She was so proud and happy. And we were so proud and happy. Is she really our little girl? I ask myself that sometimes. How did we get so lucky?